Refried Confusion: Pope Francis: Texas Relic is "the real deal"
Pope Francis: Texas Relic is "the real deal"
An unidentified retired insurance adjuster was digging a hole in a rural area of southeast Texas when he uncovered a metal chest which contained what locals are referring to as, "The Last Underwear of Jesus." The man, who refuses to be identified, told Refried Confusion, " I was digging a hole in the woods to hide my guns and ammo from Obama when I found this metal chest. I had to bang on it real hard with the bumper of an old Dodge truck laying close by. When I got it open, I found an old piece of paper and them there undergarments. I truly believe this to be the Lost Skivvies which was deposited here (Dobbin, TX) by them Templars who was running from those damned frogs (French). It's a (expletive deleted) miracle." 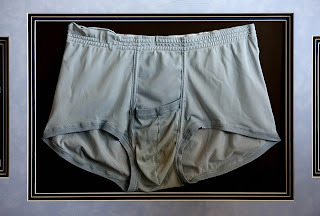 When we asked the gentleman about his plans for the "relic", he responded, "Well, the holy undies will be on display at the next gun show in Conroe." We will report further on this bizarre discovery.